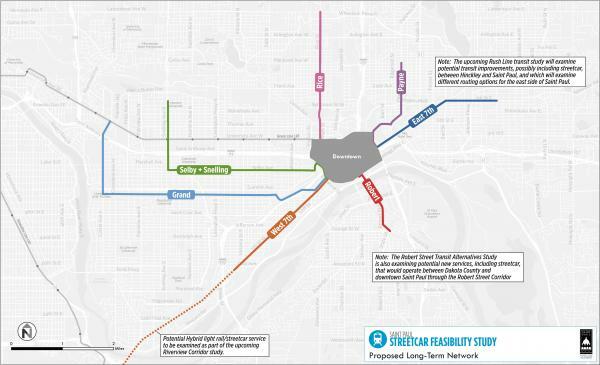 On July 9th, 2014, the City Council passed a resolution approving the long-term network of feasible streetcar routes for Saint Paul, including 7 lines: East 7th, Grand, Payne, Rice, Robert, Selby, and West 7th (see map below). 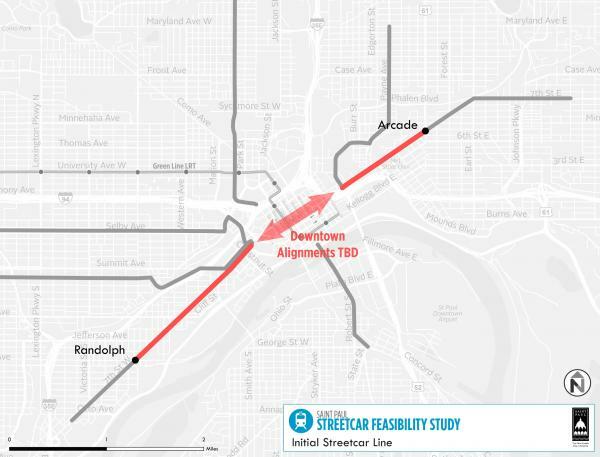 They also recognized the high potential for an East-West 7th streetcar line from Arcade to Randolph, and authorized staff to proceed to more detailed analysis of bus versus streetcars in that corridor, to be initiated only after Ramsey County concludes transit studies of the Riverview Corridor. Check out the presentation from our summer open houses here. Comments were also accepted, and can be viewed, on Open Saint Paul, Saint Paul's online forum. 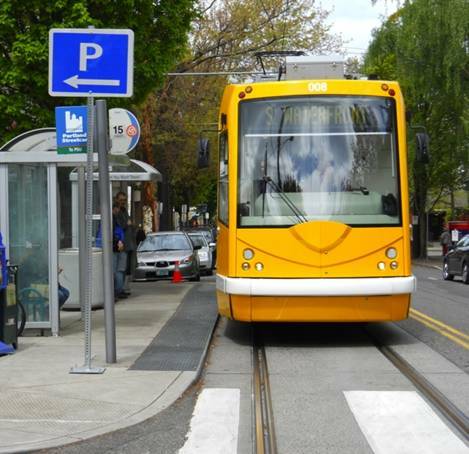 A Long-term Vision for Streetcars in Saint Paul Streetcars have the potential to be both important components of the transit system in Saint Paul, and powerful catalysts for economic development in the city. Where might it make sense to construct streetcar lines? How best could a network of streetcars serve the residents and businesses of Saint Paul, and which routes should be the first to be developed? The Saint Paul Streetcar Feasibility Study strives to answer these questions. What are streetcars all about? See our Streetcar 101 presentation. These goals are being addressed through a three phase evaluation of potential corridors. A Proposed Long-Term Network This map shows the City's proposed long-term streetcar network for Saint Paul, and are the end result of Phase 2 of this study (see below for details on the different phases). Many corridors across all neighborhoods are being studied. The evaluation process identifies a network of corridors that makes sense for Saint Paul, and prioritizes potential "starter segments" for initial investment. Phase 1: Corridor Screenings examined a universe of corridors throughout the city for potential physical fatal flaws, and further screened for supportive land uses and existing and planned zoning. At the end of this phase, the study team has come up with a list of potential lines which will be examined in more detail in Phase 2. Phase 2: Detailed Evaluation further developed these potential lines, and put them through a rigorous evaluation focusing on economic development potential, transit demand, compatible land-uses, operations, systems integration, and capital and operational costs. Phase 2 defined the long-term network, seen above. DRAFT Phase 3: Determine Starter Network and Starter Line identifies the most effective lines/segments to be pursued as the first new streetcar lines in the city. The linked memo details the full evaluation, and how the Streetcar Starter Line was determined. The proposed first streetcar line for the City of Saint Paul would connection East and West 7th Streets, from Arcade to Randolph, running through downtown. The proposal is to conduct further study of the potential for this is a 4.1 mile starter line. The City has completed work on the Streetcar Feasibility Study at this time. The City Council's resolution supporting the results of this study also directed that the Starter Line not be studied in more depth until the Ramsey County-led Riverview Corridor Study has made a recommendation. For more information on transitway studies that are ongoing, visit the Ramsey County Regional Rail Authority's website. The Transportation Committee of the Planning Commission served as a steering committee for this process. Through the course of this study, there were public open houses, District Council involvement, and opportunities for feedback at various community organizations. The city also convened a group of partner agencies and technical review staff. Two open houses were held on August 28, 2013 at the Rondo Community Outreach Library at 461 N. Dale Street. Community members were given a chance to submit comments on the proposed network and individual lines at that time. Two additional open houses were held on January 15 and 16, 2014. Details are at the top of this webpage. City staff have also been attending District Council and other community meetings across Saint Paul, providing additional opportunity for public discussion. The City thanks the generous funders who have made this effort possible: the Central Corridor Funders Collaborative, St. Paul Foundation, McKnight Foundation, and the Ramsey County Regional Rail Authority.